To me, it is my deep-rooted beliefs and values that guide how I conduct myself—not just some of the time, but all of the time, even when others are not watching. In business and in our personal lives, common advice drives us to focus on the results we want to achieve (the what). 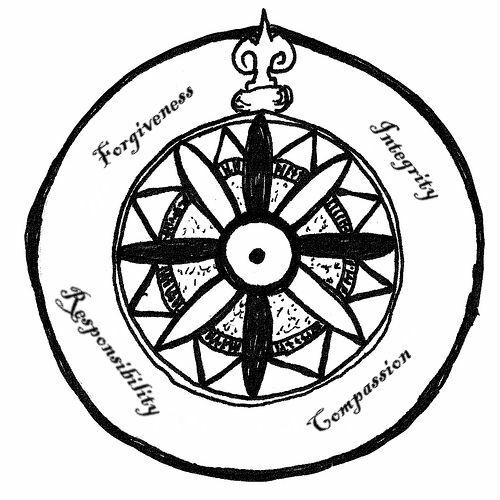 Our moral compass helps direct us by also emphasizing the why and the how we should act. Think about something as simple as your trash blowing into your neighbor’s yard. Do you leave the trash or go pick it up? It depends on your moral compass. Do you act the same way if you don’t like the neighbor? It’s important to note that not everyone’s compass is calibrated similarly. Take the above example: some may leave the trash, others may pick it up, and still others will pick it up even though it is not their trash. While this example may seem trivial, moral compasses can lead to much more profound impact. Compare Hitler’s moral compass to that of Roosevelt’s. Both men were of the same era; leaders of their countries that faced similar economic issues. Yet, their approaches to helping their countries were very different. One could argue that Roosevelt and Hitler both had similar goals for the success of their respective countries, but their individual moral compasses led them to work towards those goals in dramatically different ways. Last week, I discussed the many contradictions and decisions we are confronted with on a daily basis, some tougher to reconcile than others. When in doubt, approach these choices by consulting your moral compass. How you choose will be heavily influenced by your deep-rooted beliefs, values, and priorities. My personal moral compass is similar to Roosevelt’s. I believe in helping others and watching them succeed. That is what we have built J2 on. I have to express my appreciation to this writer for rescuing me from this type of scenario. After scouting through the the net and seeing things that were not powerful, I believed my life was over. Being alive without the presence of solutions to the problems you’ve solved by means of your main short post is a serious case, and ones that could have adversely damaged my entire career if I had not encountered your blog post. Your personal knowledge and kindness in dealing with the whole thing was vital. I’m not sure what I would’ve done if I had not encountered such a thing like this. It’s possible to at this point look forward to my future. Thanks a lot so much for the expert and results-oriented help. I won’t hesitate to recommend your web sites to anyone who should have guidance on this subject. You’re totally right. I loved reviewing this and I will certainly come back for more as quickly as possible. My website is about best homework help websites, you could look if you’re interested in this.